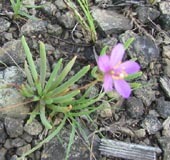 Deptford Pink (Dianthus armaria): Very small. Clusters along the C&O Canal, Great Falls National Park, MD. Photo by Ken Clark. Virginia Rose (Rosa virginiana): Might have different names in different states. Blooms in summer. These were on the Mill Mountain Trail, GWNF, VA on the approach to Big Schloss. 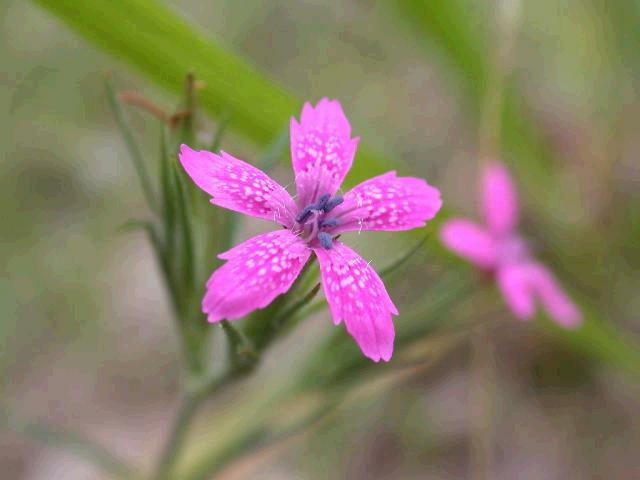 Wild Pink or Catchfly : There are several varieties. 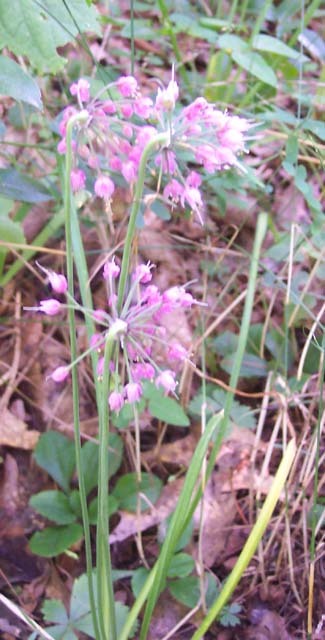 Silene caroliniana shown here is pink. S. virginiaca is red. Its sticky stem gives rise to the name Catchfly. 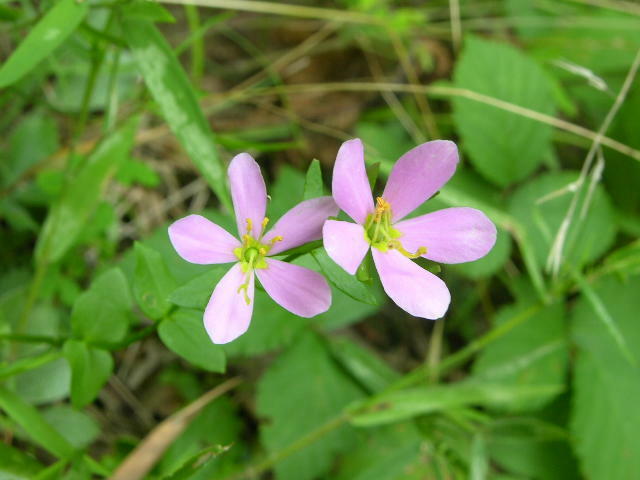 Spring Beauties (Claytonia virginica): Almost the first flower of spring. Found in shady trail-side areas. These were encountered on Jeremy's Run Trail on the last weekend of March. 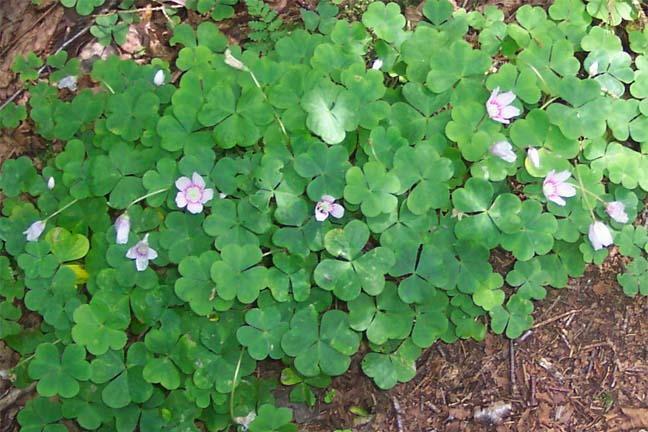 Mountain Wood Sorrel - Oxalis montana: Grows in moist, shady forests, usually at higher elevations. Location: Rohrbaugh Plains Trail, Dolly Sods, MNF, WV. 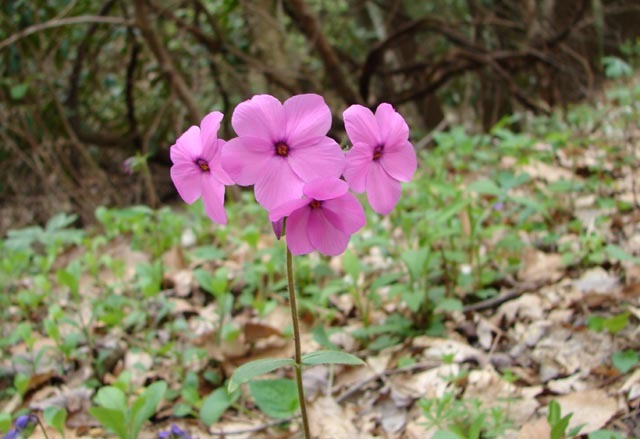 Smooth Phlox (Phlox glaberrima): Similar to Garden Phlox but blooms in May. Location: Allegheny Tr, WV. Photo by Pat Roberts. 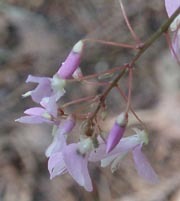 Rose-pink/Bitterbloom (Sabatia angularis) : Moist fields and roadsides. Location: Long Pond Trail, GRSF, MD. Photo by Ken Clark. 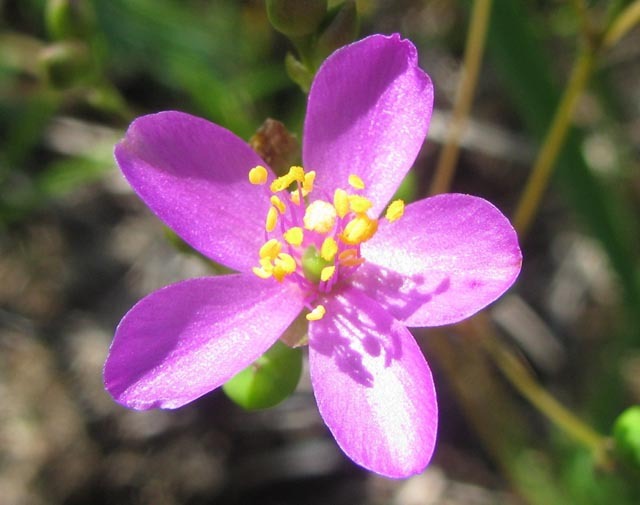 Maryland Meadow Beauty (Rhexia mariana) - Found in sandy swamps from Massachusetts south to Fla. Location: Cape Henlopen, DE. Photo by Ken Clark. 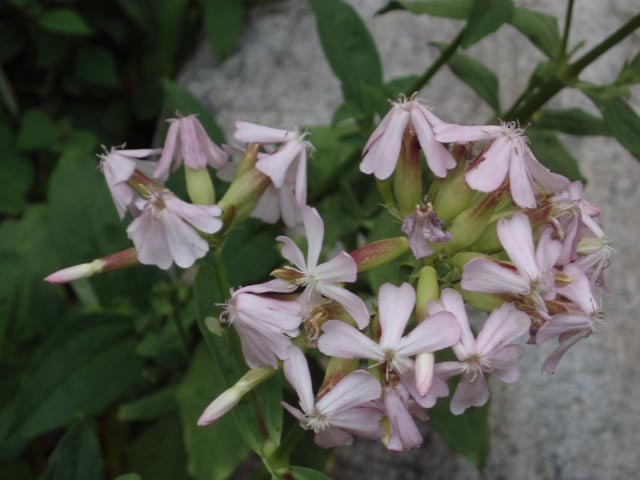 Bouncing Bet or Soapwort (Saponaria officinalis): Tall plant with clusters of white to light pink Phlox-like flower clusters. The petals are bent back upon the flower. Found in sunny waste places, fields and roadsides. 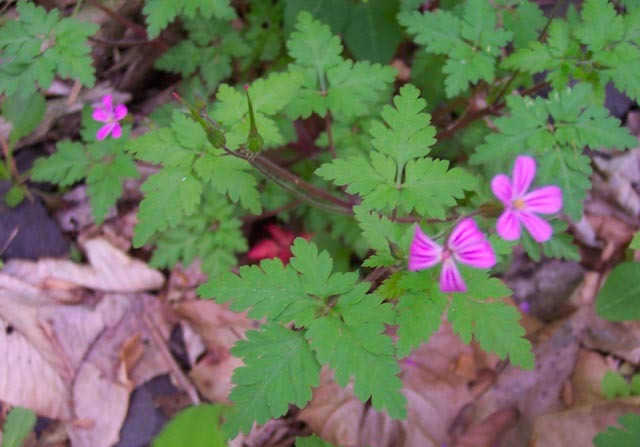 Location: Pocosin Hollow Trailhead on Rt664, SNP, VA.
Herb Robert (Geranium robertianum) - Small, paired, delightful flower with darker lines on the petals. Blooms May to October. 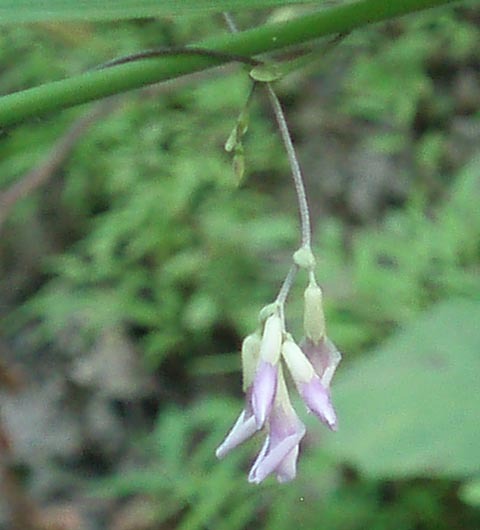 Location: Jeremy's Run Tr, SNP, VA.
Buttonweed (Diodia teres) This flower is only 1/8 inch from tip to tip. Narrow, lancelet leaves. All flowers are in leaf axils. Invasive to lawns. 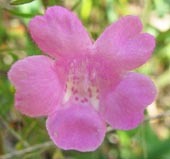 Sandplain Gerardia (Agalinis acuta): Plant grows up to 8 inches. 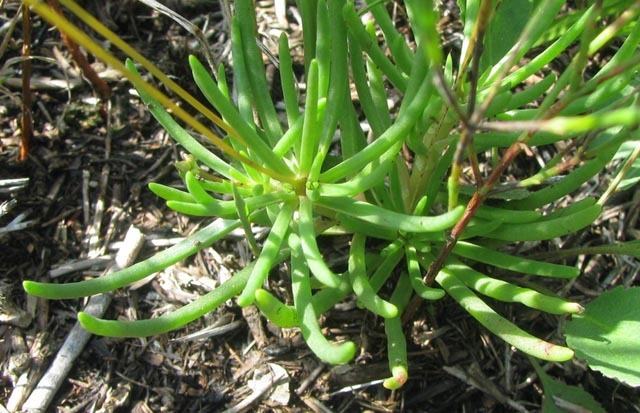 Found only in sandy, acidic areas of Rhode Island, Cape May, Long Island and Maryland. Location: Soldier's Delight, MD. Photo by Dimitri Tundra. Fameflower (Talinum teretifolium): Note the thin succulent-looking basal leaves. Found in rocks and sand. Photo by Dimitri Tundra. Purple-flowering Raspberry (Rubus odoratus): Rose-like flowers and large maple shaped leaves. Photo by Dimitri Tundra. 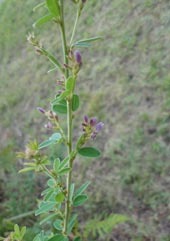 Bush-clover (Lespedeza violacea): Tall upright, much branched. 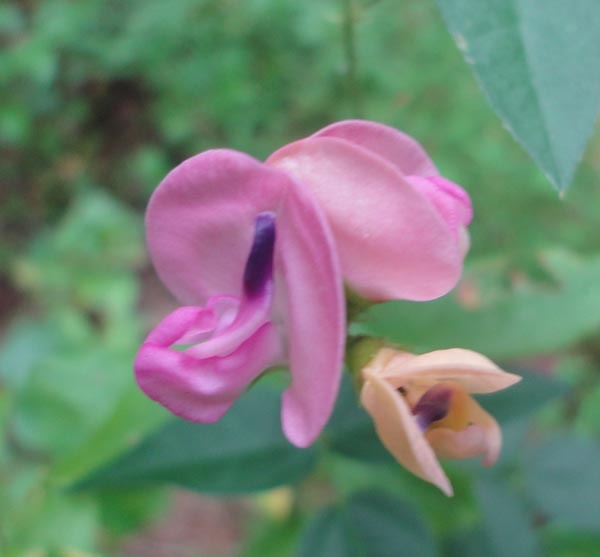 Small pink to purple pea-like folwers. Location: Morgan Run N.E.A. Slender-bush-Clover (Lespedeza virginica): Erect bush with crowded leaflets in sets of three. Flowers pink to purple. Open areas. Location: Andy Layne Trailhead, VA.
Wandlike Bush-clover (Lespedenza intermedia): Similar to Slender Bush-clover (above) but the plant has a single stalk and the leaves, although still ovate, are not nearly as narrow. 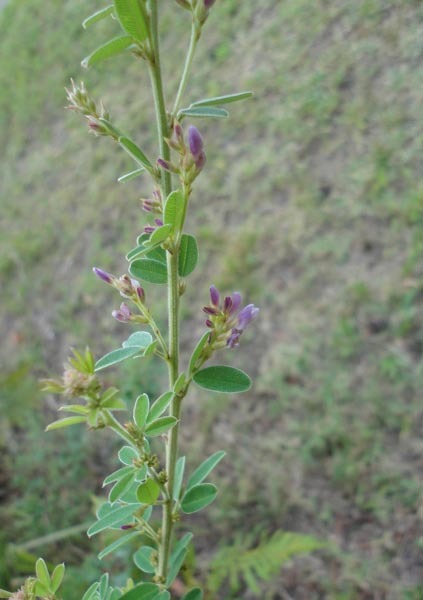 Stueve's Bush-clover (Lespedeza stueve1): Very hairy trifolate, oval to eliptical leaves on short stems sets this one off from the others. Photo by Dimitri Tundra. The flowers of all species are nearly the same. 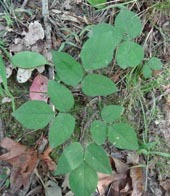 Leaves vary from species to species. 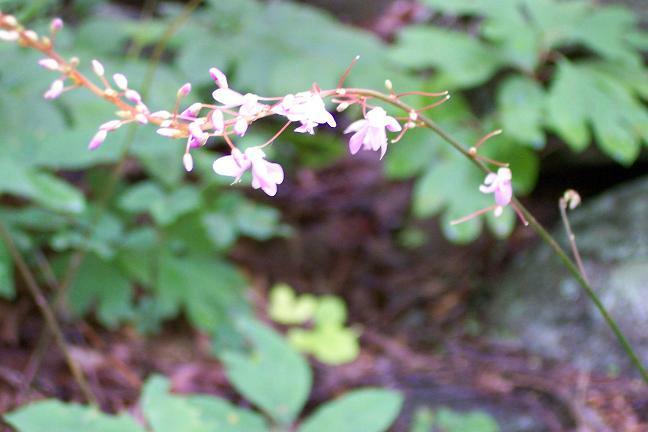 Naked-Flowered Tick- Trefoil (Desmodium nudiflorum) : Grows in rich woods. Blooms in July. This plant has a leaf stalk and a seperate flower stalk. The two are joined together underground giving the appearance of a flower with no leaves. Location: Downs Park, MD. Hoary Tick-trefoil (D. Canescens).The flowers of all Tick-seeds are nearly identical. One key difference between all of them are their leaves. In this family member the leaves are large, broad and hairy, Location: Downs Park, MD. 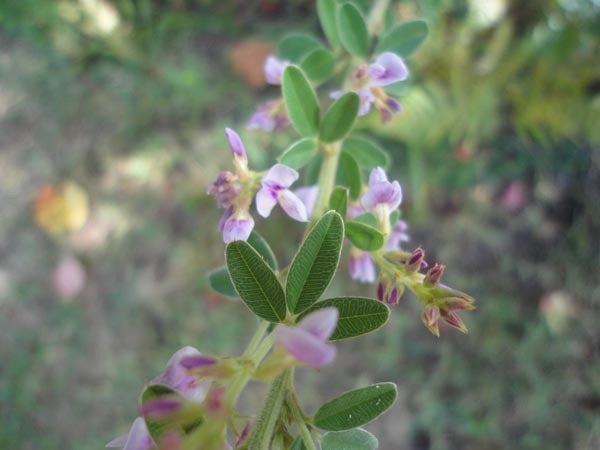 Panicled Tick-trefoil (D. paniculatum). The flowers in this photo are mostly spent after exposure to a long period of rain. 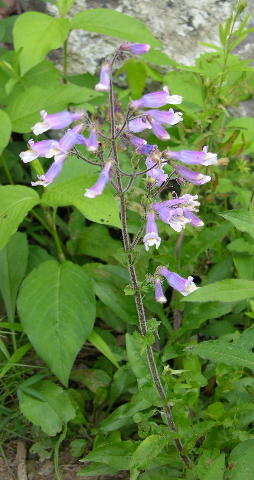 Note the long, narrow leaves with long leaflet stems. 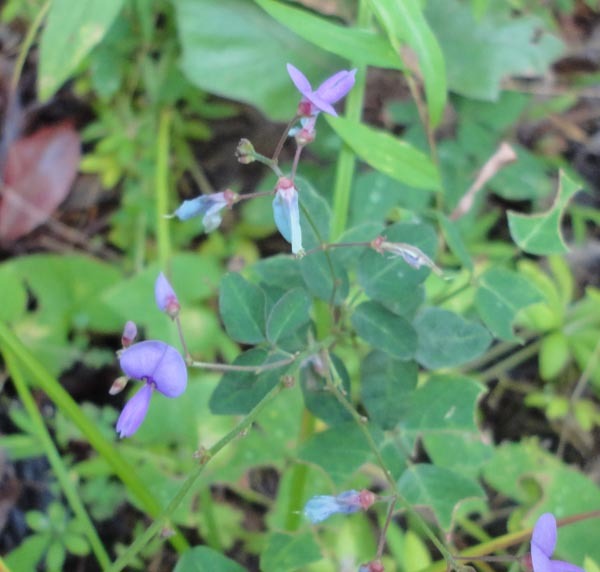 Small-leaved Tick-trefoil (D. marilandicum): The leaves on this Tick-trefoil are very small, reminiscent of clover. 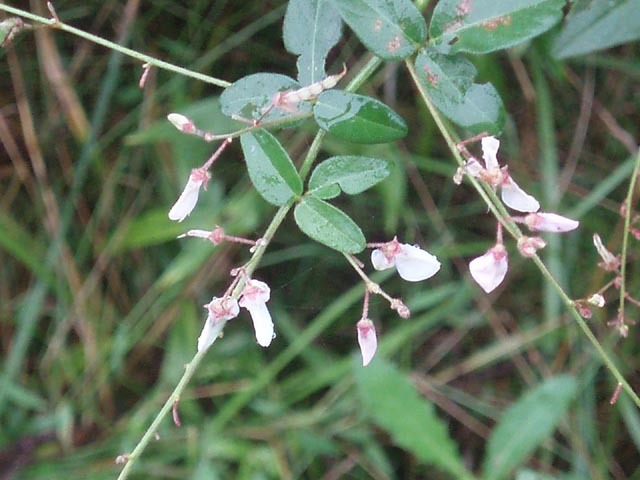 Pointed-leaved or Cluster-leaved Tick Trefoil (Desmodium glutinosum): Similar to the Naked Tick Trefoil except this plant has a cluster of large leaves below the flower stalk. Photo by Dave Bennick. 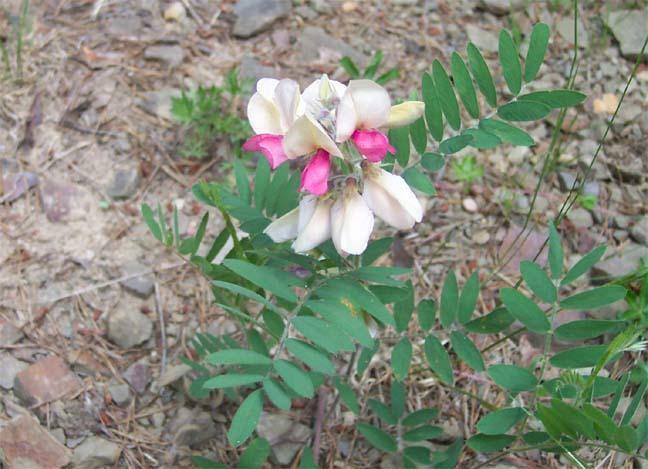 Goat's Rue or Devil's Shoestrings (Tephrosia virginiana). The roots used to be feed to goats to increase milk production until it was found to contain rotenone, an insecticide and fish poison. Location: Green Ridge State Forest, MD. 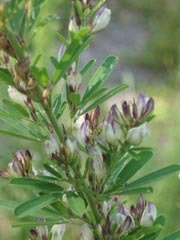 Bristly Locust (Robinia hispida): Also cultivated. Flowers similar to Everlasting Pea. Tree/shrub growing upright to 9 feet. Stiff hairs on trunk and stems. Photo by Anita Mueller. I've seen thousands of these on Gunter Ridge in the James Rive Face Wilderness Area on VA. They seemed to be taking over a large burned area. 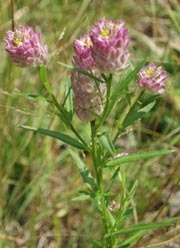 Pink Wild (Fuzzy) Bean: (Strophostyles umbellatum): Twiny habit, growing up other plants for support. 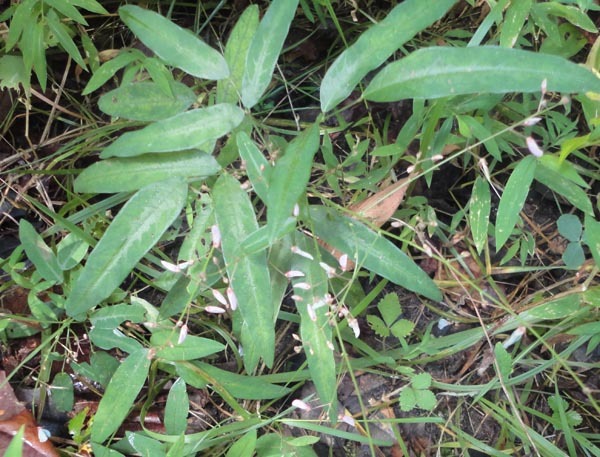 Lanceolet leaflets in threes. Flower dime to nickle sized. Hot pink flower turns peach colored aafter it has been pollinated. (See bottom photo.) Location Downs Park, MD. Hog-peanut (Amphicarpa bracteata): Twining vine with pointed leaves in sets of 3s and drooping clusters of peak-like lilac flowers in the leaf axils. 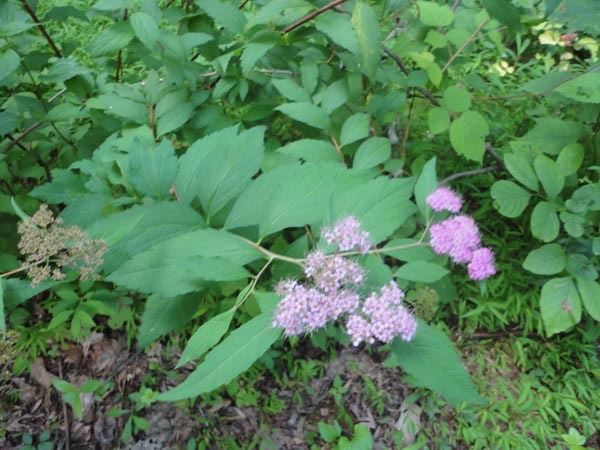 Location: Quehanna Wild Area, PA.
Japanese Spirea (Spirea japonica): Considered invasive. These were found growing along the Gun Powder River. MD above Pretty Boy Reservoir. They were at their peak in June. 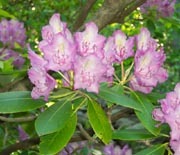 Pinxter Flower/ Wild Azalea (Rhododendron nudiflorum): Blooms May-June. 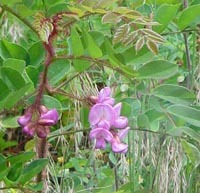 Latin name refers to the fact that it often blooms before setting leaves. Location: AT/James River Face. 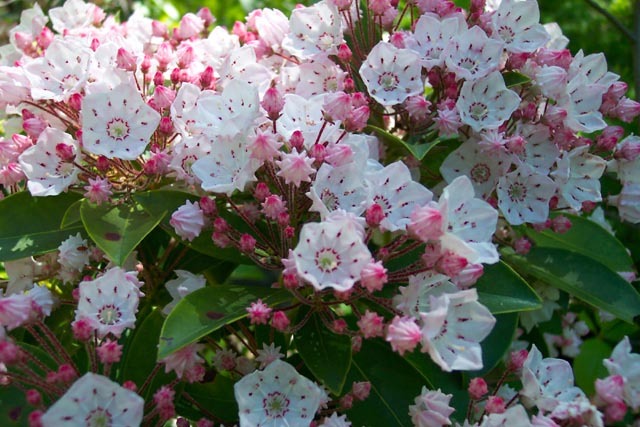 Mountain Laurel (Kalmia latifolia): Pink or white. These can be found almost anywhere in the region. These are on Mill Mountain Trail, GWNF, VA on the way to Big Schloss. Bloom in June. 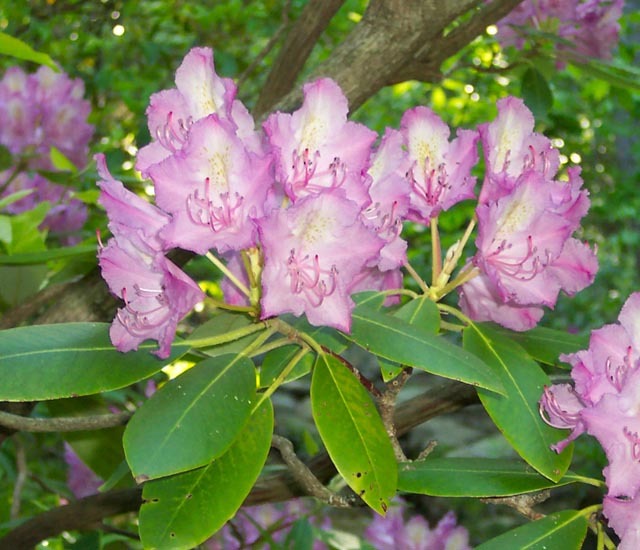 Catawba Rhododendron or Mountain Rosebay (Rhododendron catawbiense): Evergreen Shrub with large oval leaves and Rose to deep purple funnel -shaped flowers. Blooms in May. Northern limits is the southern SNP. 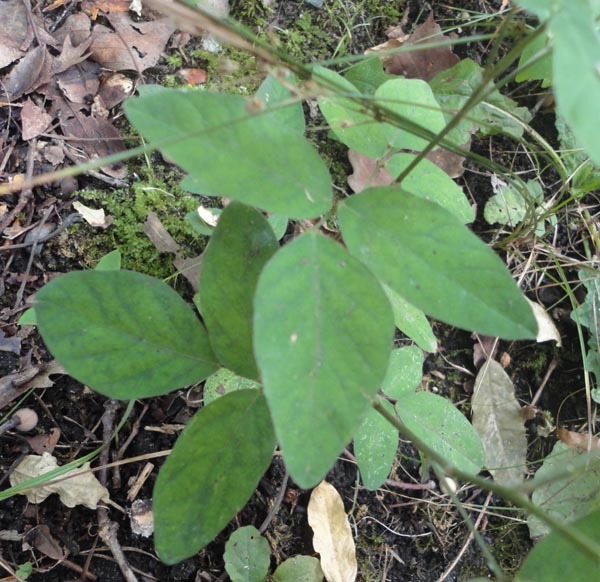 Location: Belfast Tr, James River Face, Glenwood RD, JNF, VA.
Common Milweed (Asclepias syriaca): Disturbed, moist, sunny areas. Butterflies love them! Location: Lake Sherwood Dam, MNF, WV. Poke Milkweed (Asclepias exaltata) : Grows over 4 feet in height. 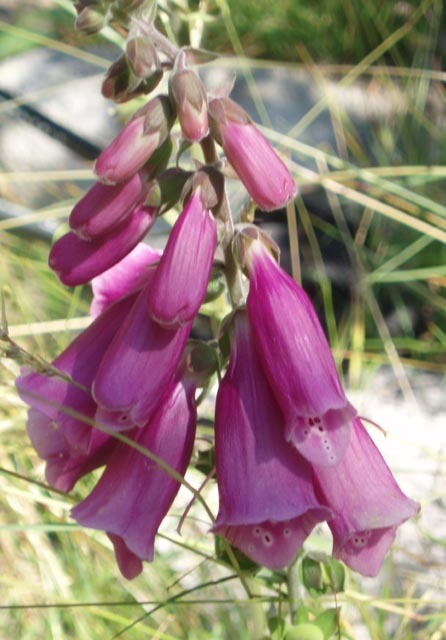 Grows in wet but sunny areas. Location: Old Rag Fire Road, SNP, VA. 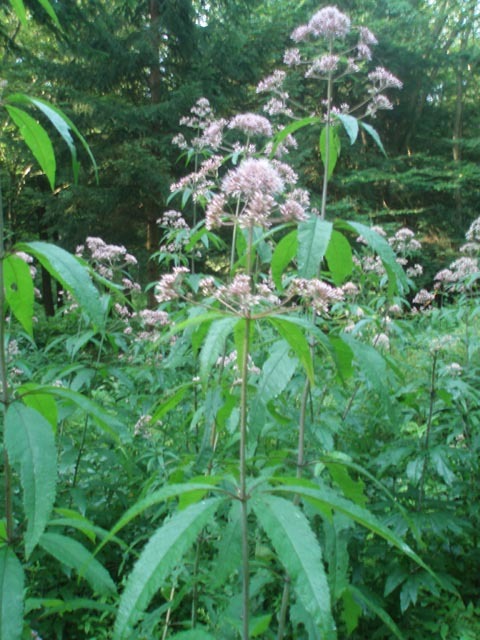 Spotted Joe-Pye-Weed (Eupatorium maculatum): Deep pink clusters of flowers supported on dark red stems. Note the whorls of 5 leaves. Location: All along Tea Creek and its Right Fork, MNF, WV. Hollow Joe-Pye-Weed (E. fistulosum): Similar to above but with whorls of 6 (not 5) leaves. Stem is hollow. Location: Quehanna Wild Area, PA. 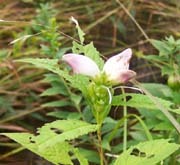 Pink (Lyon's) Turtlehead (Chelone lyons): In the Snapdragon family. 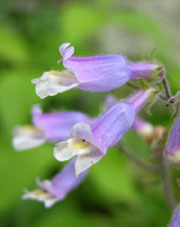 Grows in high elevations along edges in Spruce/Fir forests. Location" Hidden Passage, MNF, WV. 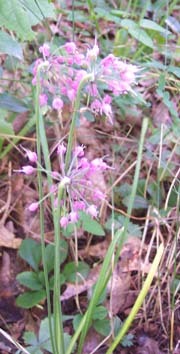 Nodding Wild Onion (Allium cernuum), in the Lily family. 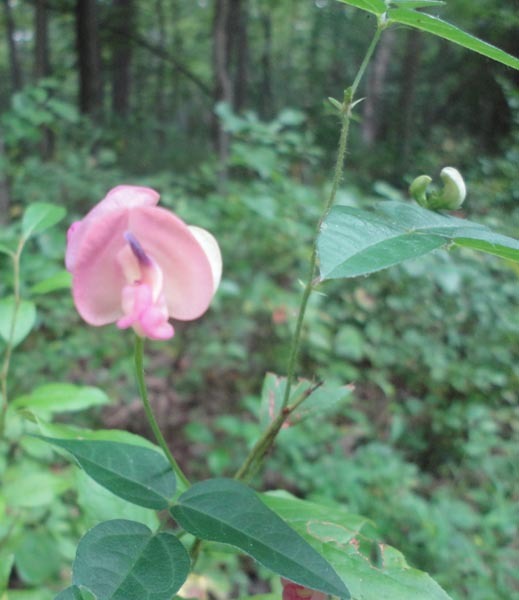 Grows in open woods. Pink to purple, occasionally white. Blooms August - September. 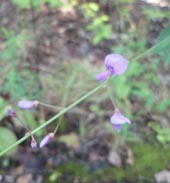 Location: Shenandoah Mt Trail, Ramsey's Draft Wilderness, GWNF, VA.
Field Milkwort (Polygala sanguinea): Alternating leaves. Found in fields and mesadows. 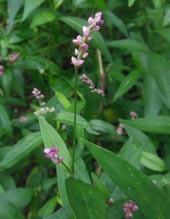 Location: Quehanna Wild Area, PA.
At first glance the casual observer might find it difficult to distinguish between the different species of Polygonum. In fact, each species has at least one, and often times other, characteristics unique to it. 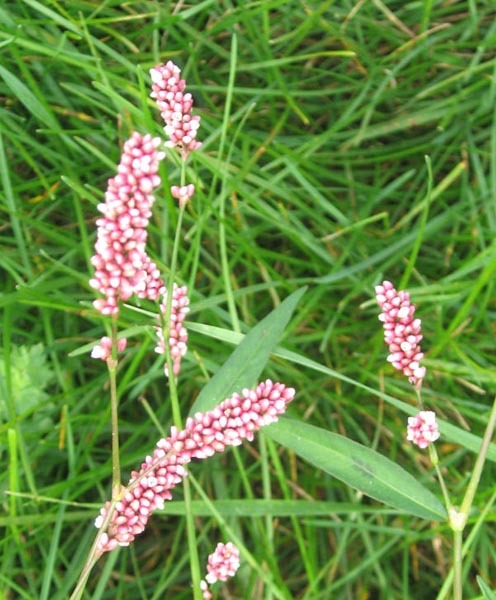 Long-bristled Smartweed (Polygonum cespitosum). This species has long bristles along the stem where the leaf "sheath" is attached. Photo by Dave Bennick. Lady's Thumb or Redleg (Polygonum persicaria): Similar to P. cespitosum accept the leaf nodes have very short bristles. Stems tinged red. Photo by Dave Bennick. 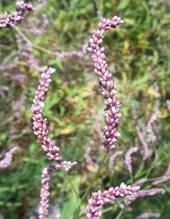 Pale Smartweed (Polygonum lapathifolium): Flower spikes longer than the previous species and bent at the upper end. Leaf sheath absent. Photo by Dave Bennick. 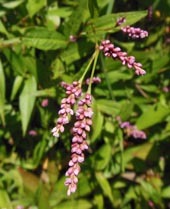 Mild Water-Pepper (Polygonum hydropiperoides): Flower spikes sparse and interupted. Found in or near water. Photo by Dave Bennick. Arrow-leaved Smartweed (Polygonum sagittatum): Shorter flower clusters than other smartweeds. Long, arrow shaped leaves. Photo by Dave Bennick. Japanese Spiraea (Spireaea japonica) A pink flowered escapee. 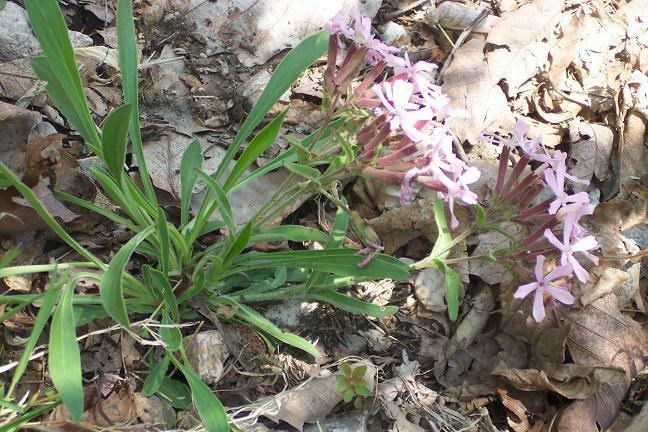 Location: Glatfelter Area of Michaux S.F., PA.
Fireweed (Epilobium angustifolium): Gets its name from its ability to quickly colonize recently burned areas. Reproduces via underground runners forming huge thickets. The deep fuchsia petals with deeper colored, thinner petals in between, the red stems and often red tinge in the leaves only add to the name. The red tinge is not always present. Location: Cranberry Overlook on Highland Scenic Highway, MNF, WV. Common (purple) Foxglove (Digitalis purpuraea): A biennial introduced from Europe and Asia. 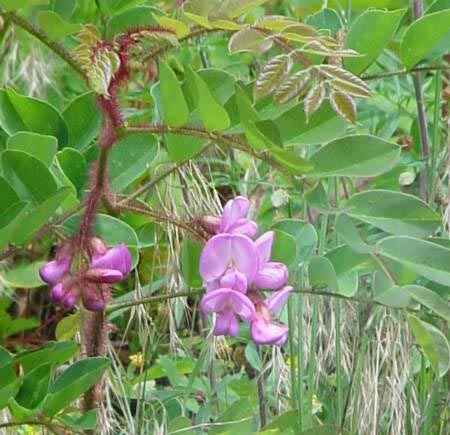 The extract is used to make cardiac medicines. 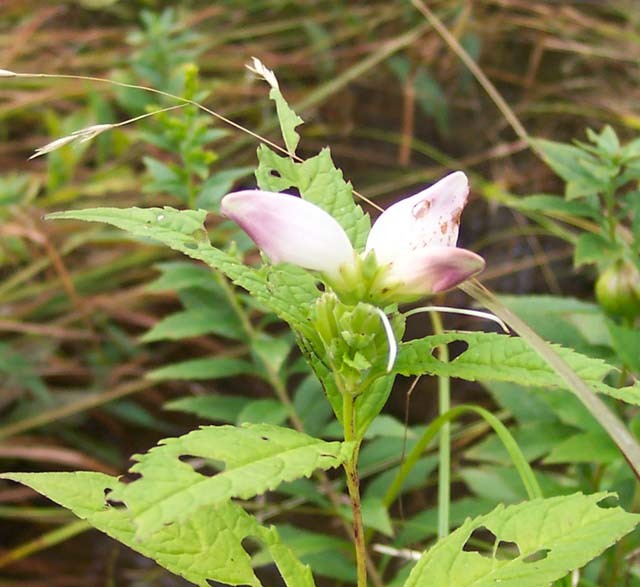 The entire plant is extremely toxic. A rosette of broad lancelet leaves form the first year followed by the flower stalk the next year. Blooms late spring to early summer. Location: Sugarloaf Mt, MD. 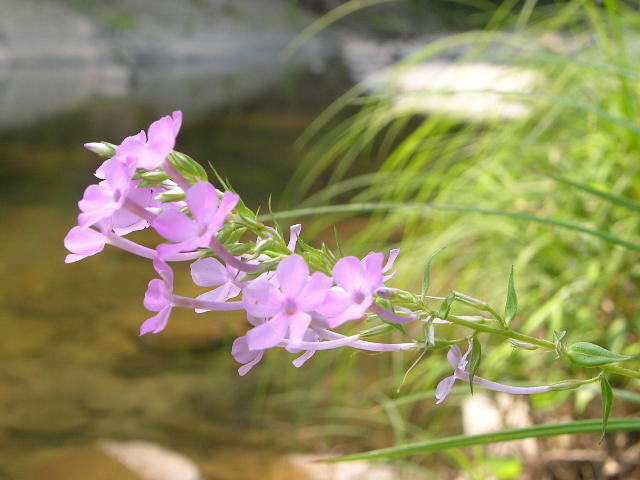 Wild Sweet William or Meadow Phlox (Phlox maculata): Found along the banks of Fifteen Mile Creek, GRSF, MD. Photo by Ken Clark. 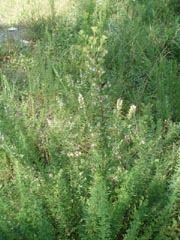 Dense Blazing-Star (Liatris spicata): Dense wand of Thistle-like blossoms w/grasslike leaves. Photo by Dimitri Tundra. 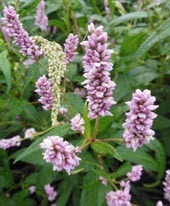 Purple Loostrife (Lythrum salicaria): An escaped ornamental capable of quickly covering vast wetland areas. Photo by Dimitri Tundra.